Next up on my list of Fridge Raiders are sweet potato and tuna fishcakes. If you're not sure what my Fridge Raiders series is all about, check out my first post here. This is all about using up those pesky bits and bobs that are always left in the fridge at the end of the week and making something tasty, nutritious and filling. I'm talking about the random bit of cheese, half a packet of spinach, some chopped onions, you get what I mean. Ingredients that may look sad on their own but when brought together with a few clever herbs and spices, can be awesome. These fishcakes make for such a tasty lunch that you'll wonder why it took you until the end of the week to make them. 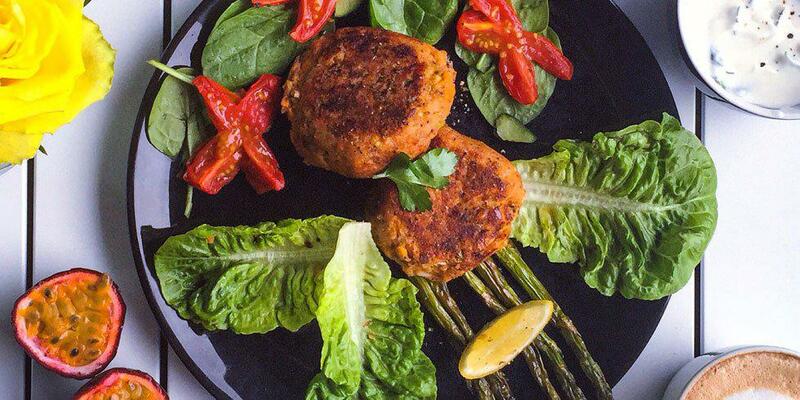 Packed full of protein, these little patties also make a great pre or post gym meal. But don't let that discourage you if you're too busy for the gym, tuna is great brain food to get you through the heaps of uni work to come. Dice 1-2 medium sized sweet potatoes into small chunks, and pop them into a oven dish or baking tray. Drizzle them in olive oil and a touch of honey and bake for 25 minutes or until soft. Once the potatoes are cooked, add them to a bowl and mash. Drain a tin of tuna and combine with the mash. For added flavour you can squeeze in lemon, crack in some pepper and salt, add some chopped spring onion, red onion, cumin or turmeric, a drop of salad cream, tabasco or simply throw in some grated cheese. Mix this well if you add in any extras. Grab a slice of bread and use a grater to make breadcrumbs, I like to sprinkle in some paprika for an added kick. Crack an egg into a bowl and whisk. Scoop about 2 heaped tablespoons of the tuna mix into your hand and make burger shaped patties. Dip each patty into the egg and then roll it into the bread crumb mix. You may need to pat the breadcrumbs onto the patties well so that they stick around. Repeat until you have used all of the ingredients. Serve with spinach, lettuce or any other left over salad mix! And, if you happen to have greek or natural yogurt left over, add some paprika or mixed herbs and a squeeze of lemon or minced garlic to make a delicious dressing.